The fourth incomplete source is called the Fernhill Park inventory of paintings printed in F.G. Lee's The History, Descriptions and Antiquities of the Prebendal Church of the Blessed Virgin Mary of Thame (1883). The problem is, the first two sources are in conflict with the third and fourth. Knollys's personal dictionary and the funeral monument both suggest that the couple had 14 children altogether, 7 boys and 7 girls. The first three sources all agree that no matter the total, there were the same number of girls as boys. My esteemed colleague Jane Lawson suggests that there may have been a misinterpretation of a comment by Sir Francis in a 1568 letter to William Cecil in which he wrote "I have six sons living, besides my eldest". (See Calendar of State Papers, Scottish, 1563-9; letter from Francis Knollys to William Cecil, 12 Sept 1568.) The line on its own points to seven sons: 6 (living) + 1 (eldest) = 7 total sons. If, however, one supposes the infant effigy representing Dudley Knollys on the funeral monument is a boy, then there were 8 sons: 6 (living) + 1(eldest) + 1(dead) = 8 total sons and therefore an equal number of daughters, or 16 children altogether. 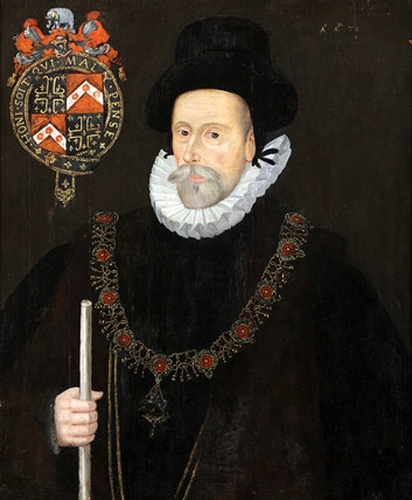 Two sons, Edward in 1575 and Henry in 1582, predeceased their father (1596), but were alive when the memorial plaque is believed to have been created only a couple years after their mother's death in 1569. Meanwhile, the Westminster Abbey memorial plaque to Katherine says that she had 8 boys and 8 girls, 16 children in all. The memorial plaque in Westminster Abbey was rehung in the 1960s during a reorganization of the Chapel of St. Edmund. One hypothesis that would explain the discrepancy were if the plaque were recast during this refurbishment. However, the Abbey assures me this is not so. The style of the decorative work on the plaque is consistent with the styles of the mid 1500s, which supports the Abbey's records. The fourth source, the Fernhill inventory of Knollys family portraits, from the 1880s, introduced more confusion to the historical narrative when one subject was listed as Cecilia Knollys, suggesting a previously unknown daughter. The author of the list, General Sir William Knollys, is reported to have qualified his identification claiming the paintings were hung too high for him to accurately read their labels. Once 'Cecilia's' portrait had been brought to a normal viewing height it was easy to re-identify her as Elizabeth because her initials are on the painting. But Cecilia's existence was written into the historical narrative, primarily by Violet Wilson in her influential (1922) Queen Elizabeth’s Maids of Honour and Ladies of the Privy Chamber, and again in the Oxford Dictionary of National Biography entry for her father, Sir Francis Knollys, since corrected. As I wrote previously, we now know that the infant child depicted in the funeral effigy, Dudley Knollys, was a girl, not a boy as had been previously assumed. The Knollys funeral monument in Rotherfield Greys. There are seven female weepers kneeling alongside their mother representing the couple's 's seven daughters. The infant effigy representing Dudley is lying next to her mother, Katherine Carey Knollys. Photo by Eric Hardy. As you can see, the funeral monument depicts 7 boys on one side, all with different haircuts, and 7 girls on the other side, plus an infant lying next to the mother. This would make 15 kids, which we know is not the case because the funeral monument in Rotherfield Greys represents even numbers of girls and boys as weepers and the Westminster Abbey plaque states that Katherine Knollys had an equal numbers of boys and girls. So, what is the explanation for the additional infant? The male weepers representing the seven sons alongside their father. Not all seven are visible from the angle of this photograph. The sixth son is hidden but the cushion he is kneeling on can be seen. Photo by Eric Hardy. The explanation is that she is depicted twice: once as the baby you see, which we now know is actually female, and again as the last weeper in the line of daughters. She's not the only Knollys child represented twice. William Knollys is the first weeper in the male line and is also on top of the canopy kneeling with with his viscount coronet on facing his second wife Elizabeth Howard Knollys. Knowing that Dudley was a girl solves the problem of the conflicting sources, reinforcing the Rotherfield Greys monument and the dictionary's account. 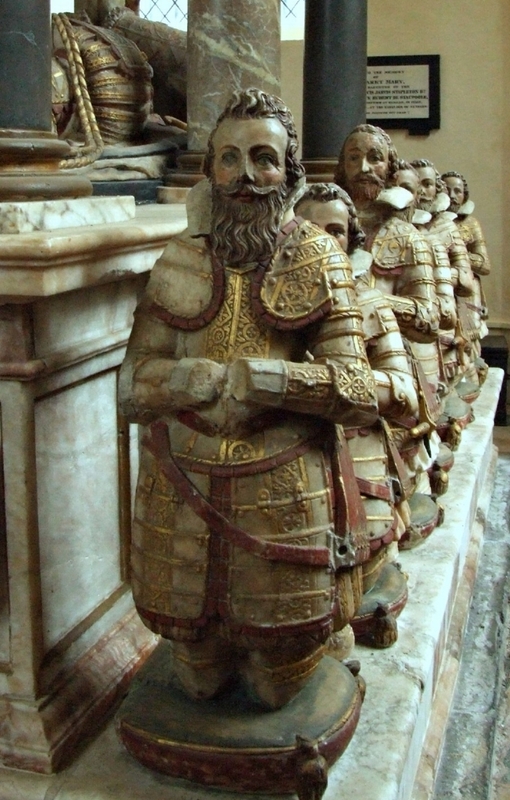 The scale of the Knollys funeral monument in the side chapel, St. Nicholas Church, Rotherfield Greys. almost overshadows the rest of the church. In other words, there is a typo in Westminister Abbey. And it's been there for 450 years. Sir Francis Knollys, unknown artist, currently hanging at Greys Court, near Reading. If the plaque is wrong, why didn't Sir Francis try to get it fixed during his lifetime? That is a question that needs further investigation. Katherine died while he had custody of Mary Queen of Scots who had fled to England six months previously. He despised being Mary's guardian. Letters between Francis and Katherine at this time make that quite clear. It's possible he did not care about the plaque in the Abbey. After all, this is a man who recorded the births of his children in a Latin Dictionary, not a bible. Katherine died in January 1569. In February, Francis, already a Privy Councillor, was a busy man. He was appointed to a commission to inventory the ordnance and order more supplies if warranted, was serving as Lord Lieutenant of Oxfordshire, was managing leases and lands that he was restricted from selling because they had been granted to him and his late wife jointly, and by November was dealing with the Rebellion of the Northern Earls, where multiple family members were in the field supporting Queen Elizabeth. Plus, he still had five children under 16 years. Perhaps he was too busy with the living to care about the memorial plaque. Although Queen Elizabeth had paid for an extravagant funeral for Katherine, or, perhaps because of this, he did not feel it worth the time and funds for a corrected version. Oh, did I mention Sir Francis was 58 at the time?